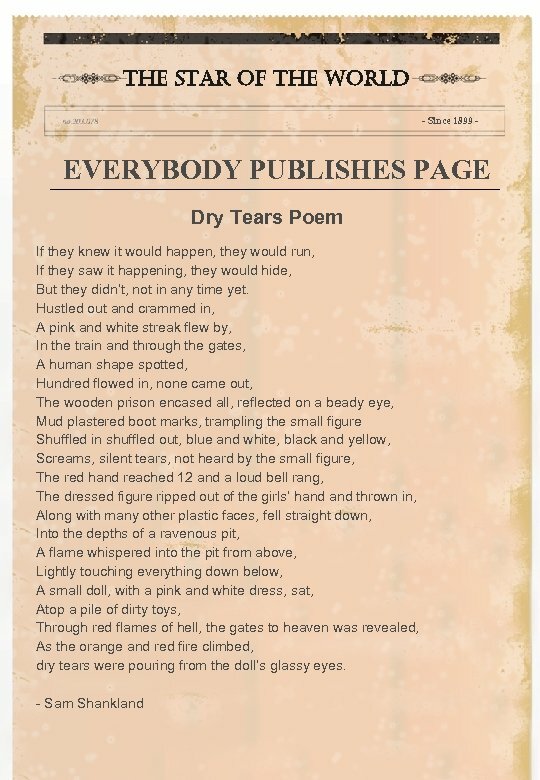 the star of the world Brightest paper ever Made - Since 1899 - HOLOCAUST HORROR REVEALED A night to remember EVA GALLER Eva Galler, aged 20 speaks of her death camp train escape story. As people began to pull out the barbed wire on those little windows and jump through, my dad said to me “Jump, you must jump, you are the oldest child so jump. Take your chances. ” As I jumped out of the window I heard shots, many shots. I was so scared but not hit. I landed in a clump of snow and waited for the bullet, as soon as the sound of that train dispersed I went to look for my brother and sister who had jumped before me. I found them…dead, each had been shot and not made it. After the war I changed my name and worked as a slave for a farmer. I was under a false identity as a Pole. Later I moved to America. 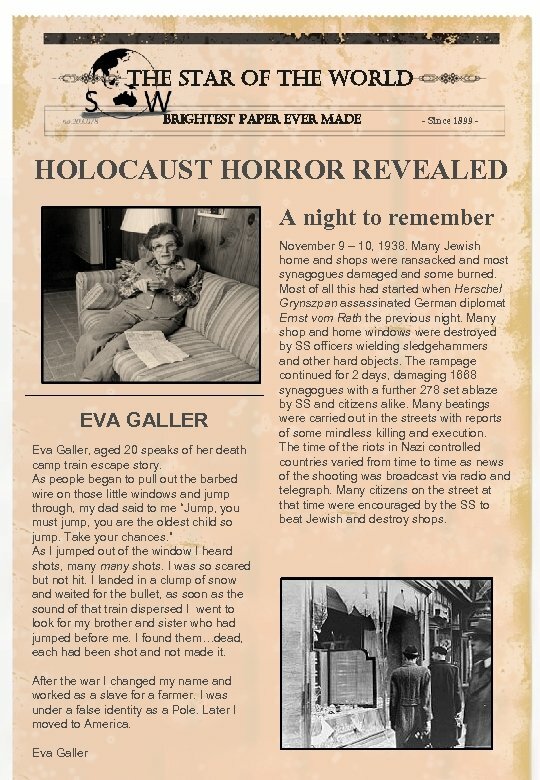 Eva Galler November 9 – 10, 1938. Many Jewish home and shops were ransacked and most synagogues damaged and some burned. 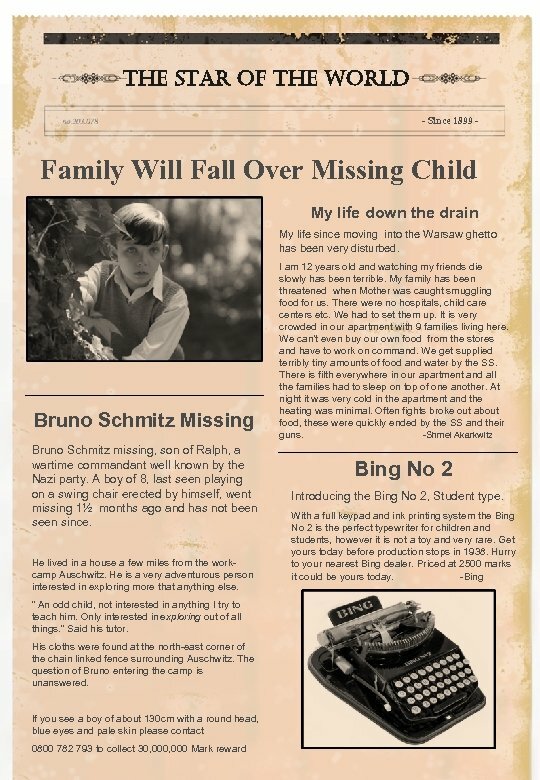 Most of all this had started when Herschel Grynszpan assassinated German diplomat Ernst vom Rath the previous night. Many shop and home windows were destroyed by SS officers wielding sledgehammers and other hard objects. The rampage continued for 2 days, damaging 1668 synagogues with a further 278 set ablaze by SS and citizens alike. Many beatings were carried out in the streets with reports of some mindless killing and execution. The time of the riots in Nazi controlled countries varied from time to time as news of the shooting was broadcast via radio and telegraph. Many citizens on the street at that time were encouraged by the SS to beat Jewish and destroy shops. 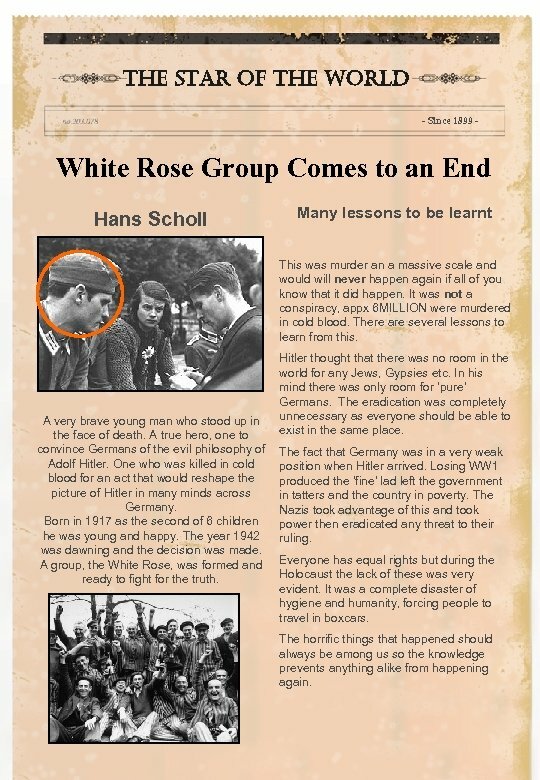 the star of the world - Since 1899 - White Rose Group Comes to an End Hans Scholl Many lessons to be learnt This was murder an a massive scale and would will never happen again if all of you know that it did happen. It was not a conspiracy, appx 6 MILLION were murdered in cold blood. There are several lessons to learn from this. A very brave young man who stood up in the face of death. A true hero, one to convince Germans of the evil philosophy of Adolf Hitler. One who was killed in cold blood for an act that would reshape the picture of Hitler in many minds across Germany. Born in 1917 as the second of 6 children he was young and happy. The year 1942 was dawning and the decision was made. A group, the White Rose, was formed and ready to fight for the truth. Hitler thought that there was no room in the world for any Jews, Gypsies etc. In his mind there was only room for ‘pure’ Germans. The eradication was completely unnecessary as everyone should be able to exist in the same place. The fact that Germany was in a very weak position when Hitler arrived. Losing WW 1 produced the ‘fine’ lad left the government in tatters and the country in poverty. The Nazis took advantage of this and took power then eradicated any threat to their ruling. Everyone has equal rights but during the Holocaust the lack of these was very evident. It was a complete disaster of hygiene and humanity, forcing people to travel in boxcars. The horrific things that happened should always be among us so the knowledge prevents anything alike from happening again.